The new publication Weed Control. 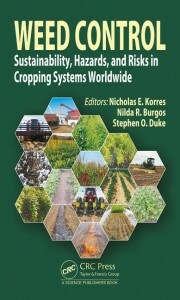 Sustainability, Hazards and Risks in Cropping Systems Worldwide edited by Nicholas E. Korres, Nilda R Burgos and Stephen O. Duke and published by CRC Press, Taylor & Francis Group has been released. The publication investigates concerns about sustainable food production systems along with the evolution of herbicide-resistant weeds, and addresses important topics of weed science related to sustainable issues, potential hazards, and risks. In addition the effects of herbicides and weed control methods on soil, freshwater ecosystems and insects are critically reviewed. Occupational hazards due to non-judicious use of herbicides along with occupational hygiene practices for using herbicides such as use of personal protective equipment, spillage management herbicide storage, and drift avoidance are discussed in detail. The potential use, types, advantages and disadvantages of bioherbicides and allelopathy for sustainable weed control and research needs are explored in depth. Important issues of herbicide resistance evolution, distribution in major crops, and the contribution of genetically engineered herbicide tolerant crops on sustainable weed management are examined thoroughly.